Here’s Day 7 of The St. Anne Novena! Good morning. I just submitted an answer to my prayer. I was asked to check a box to confirm that I’m not s spammer. These novenas are awesome. God is good. all the time. For the means to purchase the house next door. I am presently renting. Yes my prayers were answered on the safe delivery and birth our first grand daughter Gabriella from our son and his wife. All the glory belongs to God. 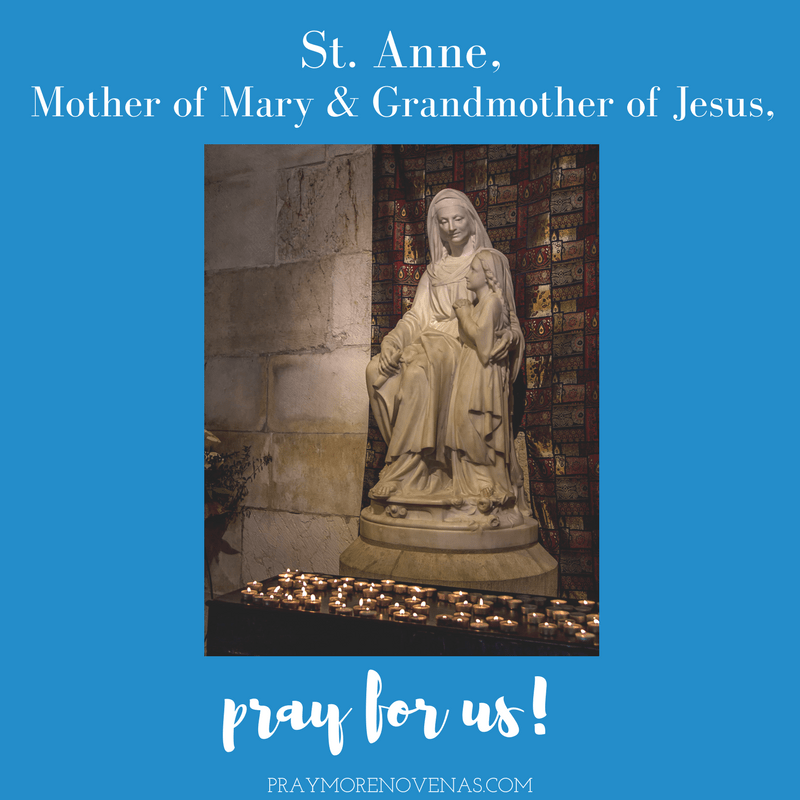 St.Anne intercede and pray for my brother and my dad.Praying for my sister in law to stop going and believing in witchcraft and to turn to God and Jesus to save her. Let me, Lord, patiently endure my physical pain and suffering, with Your mercy upon me. I have been suffering with pain every day for years. Please help we to remember to ask the Lord to shine His Mercy upon me every time my pain is worse or severe, no matter how many times a day. Each time, every time, let that be a time to pray for the mercy of our Lord. Dear st anne please pray for my son to seek a xareer in the naxy. Open his eyes and keep him focused. For my daughter may she find peace at work. Find a good man to love her fot who she is. Intercede in thier lives for a better future. For my eyesight to improve and fins a dr to cure this ailmevt. For my husband to get well be a strong man. I ask this in the name of jesus. Amen. and for our aunt stella may she rest in peace. Please pray for me and with me, that the good Lord will heal my heart of all past hurts and give me the grace to forgive, open up and favour to give and receive love again. I ask for your intercession for the healing of Uncle Vin and for continued strength for his family. He has been recovering from abdominal surgery and continues to encounter complications. Please pray that his wounds heal completely and he is restored to good health. Thank you! May the world become a much more peaceful and safer place in these trying times. God’s People Matter and may we all exercise Mercy, Kindness towards one another. May we take some time out and visit a sick or lonely relative, or friend in hospital, senior home. Stop the rejection now and heal the hearts of suffering due to the lack of forgiveness. St. Anne help us all to be transformed in Jesus Holy Name. Pray for individuals suffering from the lost of love ones due to accidents, wars or gun violence’s. Jesus I give all my concerns to you at the foot of the Cross through the intercession of St. Anne. I pray that priorities change by starting with a stronger prayer life. I pray that all of God’s people have a real desire to seek the truth and discover ones true purpose in this lifetime. Please pray for mother dpi to it’s health to improve. As well pray for my daughter and son spirit health and guidance to accomplish want God desire s of them. Dear St. Anne, Please pray with me for MS and AV to begin a committed relationship eventually leading to Holy Matrimony. Please St. Anne hear my prayers. I promise to encourage devotion to you and my beloved saints, St. Jude, St. Anthony, Blessed Mother and the Sacred Heart of Jesus. Thank you for prayers previously answered. Please pray for restoration of my husband‘s health. Please pray for my son‘s education. Please pray for my daughter‘s job/education and health. Pray for peace. Through the intercession of Saint Anne I surrender all of my family and friends who need physical and spiritual healing. I continue to pray for their souls and the souls of all in purgatory. St .Anne please help me.guide me give more wisdom and peace while I’m reviewing in preparation for my nursing board examinations on November 17 and18..Help me to be the topnochers with the average of 88%..Help me.to.fulfilled my dreams to be a registered nurse ..Amen.. I pray for money to pay my son’s tuition fees which is now over due.lord please release the finances. Lord I pray for financial deliverance. I pray that you put up a wall between pcs ‘ g ,o and gg.that you blessed morher. Praying for John Paul & Annie in their health & work…..